This young director is doing big things in our little city. Meet the creative and talented videographer behind this local production company. Since childhood, Alexa Wint has had a love affair with the movies, and she’s always known she was meant to be a director. 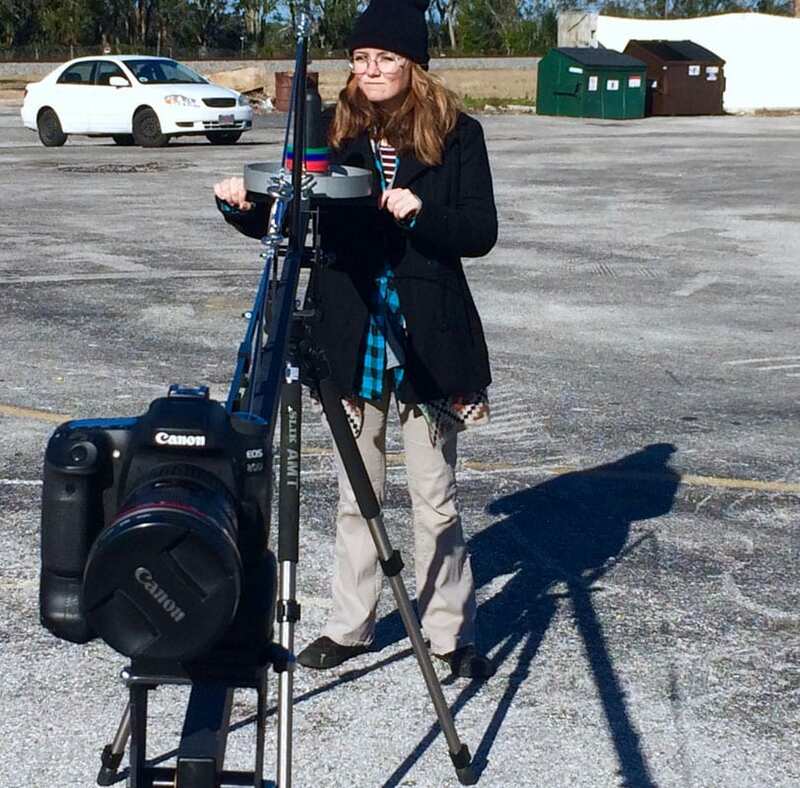 After receiving her degree from Flagler College in Documentary Production, she founded Nicalex Productions. Nicalex is a company that produces short films and documentaries. In addition to producing fiction and nonfiction narratives, Nicalex Productions creates commercials, music videos and captures the beauty of weddings. Under the umbrella of Nicalex Productions, she has had the pleasure of working with various clients such as Preserved, Stir It Up, Warehouse 31 Unleashed, and Push Push Salon. Hugh: Connection to St. Augustine? Alexa: I am a born and bred native to St. Augustine. A videographer is a one-man band. They are the director, camera operator, drone operator, and editor. They typically work on smaller commercial projects for companies and capture weddings. It takes a great deal of technical and artistic skill to be a good videographer. There are three phases in creating any video: pre-production, production, and post-production. Pre-production is the planning and developing phase where you lock down locations, talent and develop a storyboard and shoot schedule. The production phase is the physical shooting of the project. Finally, the post-production phase which is the editing phase and by far the longest portion of producing a quality video. A good videographer not only has the necessary equipment such as cameras, lights, and mics, but they must have a knowledge of lighting and composition within the frame in addition to excellent editing skills. When I see the audience suspend their disbelief and buy into my film, that is the best part. When it comes to commercial or promotional videos, seeing the clients light up because they love the work is also incredibly fulfilling. What would be your dream project in St. Augustine? I’m working on a feature script right now. The story takes place here in St. Augustine. I would love to shoot the film here, it would be amazing! It depends on how big the project is. We just wrapped on a short thriller called Hope, which will be released on Halloween. We had three crew members, not including myself and the cast. Who/what are your local favorites? I love to eat at Taco Shop, beachside. Stir It Up is another top fave, plus Cynthia is super nice. When I’m craving pizza it’s Pizza Time all the way. Ultimately my favorite place in St. Augustine is a tie between the beach and salt run. I love to surf, but paddle boarding is just as fun. I would love to see a community of filmmakers emerge out of St. Augustine. It’s unbelievable that we don’t have a booming film culture here on account of how beautiful and diverse St. Augustine is as a location. What are the challenges in your business in St. Augustine? I would say a challenge as a whole, not even just in St. Augustine, is that people don’t really know what a videographer does. They don’t know how mentally and physically labor intensive the work really is, so they assume they can get a killer video for less. I would like to give a shout out to my family. Without their support, I wouldn’t be able to chase this crazy Mt. Everest of a dream. A special thank you to my mom, one day we’ll be at the Oscars. And of course I really appreciate working with the creative team at That Moment Productions, I’ve learned a lot and I look forward to working with them more, especially Franchot Barba he’s a visionary. And of course a big thank you to my business partner and good friend Joshua Noel from Sonduck Film. I can’t wait to make more awesome films with you, brother. Like Alexa Wint on Facebook at www.facebook.com/nicalexproductions and follow her on Instagram at @nicalexproductions. Interviewed by Hugh Ward.